EmeraldChat is free video & text chat with many feratures. The best feature is that you can chat with strangers without bots! Emerald Chat introduces a lot of interesting features that are not often seen in online chat sites. This is one of the chat rooms sites that allows you to connect with strangers who can very often surprise you. This chatting app has an intriguing way of matching people with each other so they can talk and get to know each other. It lets you rate the users based on how cool and inviting they are, if you would recommend them to a friend or not really. Enter the webcam app that is similar to camsurf and shagle, yet says it can easily turn out to be a better tool for chatting with strangers online. You can share photos and videos with the people you are having conversations with, talk to them about anything, you reveal who you are through your own chosen process. Making friends online has never been this easy before. Go to private, one-on-one chat rooms and start conversations with people from other parts of the world. Maybe you can arrange to visit one of your new online friends in their own country? Everything on Emerald Chat takes place on a very pretty, emerald-looking background. Join the chat site that is made for everyone, by everyone. The people you chat with are only and strictly real people, you never get matched with bots. the creators of it took care of every detail and started a unique matching system that is based on every particular user's hobbies and preferences that can be carefully selected in the options menu. How to use Emerald Chat? 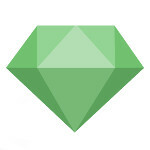 Emerald Chat can be seen as an omegle alternative site that’s worth paying attention to. This webcam chatting site tries its best to remove all bots and fake people from the chat, so you can be sure that the number of fake profiles is limited. You can count on having quality conversations with cool people online. Some features include matching people based on their interests - their shared hobbies. If you want to get more features in one, you need to purchase Emerald Gold to enable them. This is one of the sites like chatroulette that doesn’t provide only private chat rooms - but these are also available, both 1 on 1 text chats and video chats. But this website also lets you start group chats online so you can talk to more people at the same time. As you’re chatting with someone, you can share files and pictures with them. You can also rate users based on how enjoyable the conversation was. Emerald focuses on the importance of making new friends or rather actually getting to know someone, without excessive sexual behaviors or displays. On Emerald Chat you can get a real friendship experience, chat with strangers about anything and connect with them. You can also create your own profile, so you can keep all your messages and friends in one place. You can go back to your chats and continue them with those that you get along with. Many features require making a payment, but there are still plenty of options that are available for free.